Even before starting the LCHF lifestyle, a waffle or pancakes were never my go-to breakfast order. I am usually an omelette person. These waffles may have changed my mind. I have tried a couple of different waffle recipes but they all came across with a strong coconut flavor and dryness from the coconut flour. This recipe is the exception. The maple extract takes them over the top. I also use these waffles in my Blueberry Waffle Ice Cream recipe. They are insanely good mixed with the creamy ice cream and sweet blueberry sauce. I made a full recipe (about 4 large waffles) expecting to freeze some for a rainy day. That plan went out the window when the kids caught a whiff. They loved them and now ask for them on a regular basis. As I have said, I am trying to win my kids over with some of these recipes. I do not want them to struggle with weight the way that I have over the years. This was a real win for dad! Combine cream cheese, eggs, vanilla, Splenda, maple extract , and cinnamon in a blender or NutriBullet until completely combined and smooth. Add melted butter to waffle batter. Note: Coconut flour tends to absorb liquid quickly. You may need to add a splash of almond milk to the batter if it becomes too thick. Add batter to preheated waffle iron. 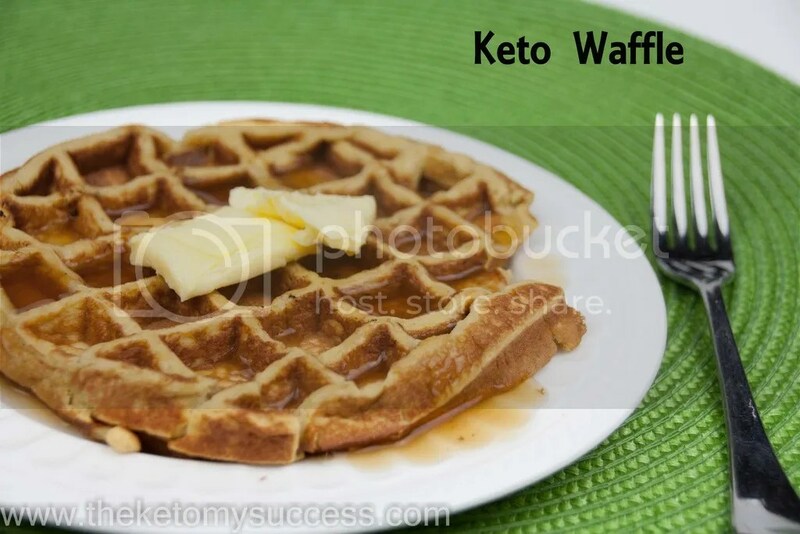 Cook per the directions with your waffle iron. I feel like I’ve been dessert heavy on the blog (my weakness.) So, I decided that I would explore and add some more main dish recipes to our repertoire. 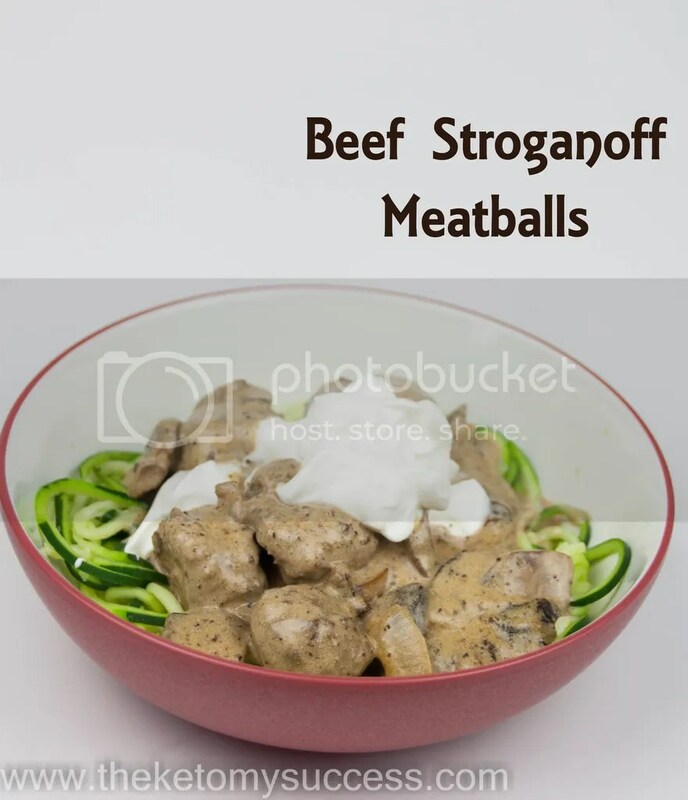 I was exploring one of my favorite blogs, I Breathe I’m Hungry, and found this delicious meatball recipe. The meatballs and silky sauce are chalk full of flavor and falls well within our dietary macros! I served this atop a heaping pile of zucchini noodles. 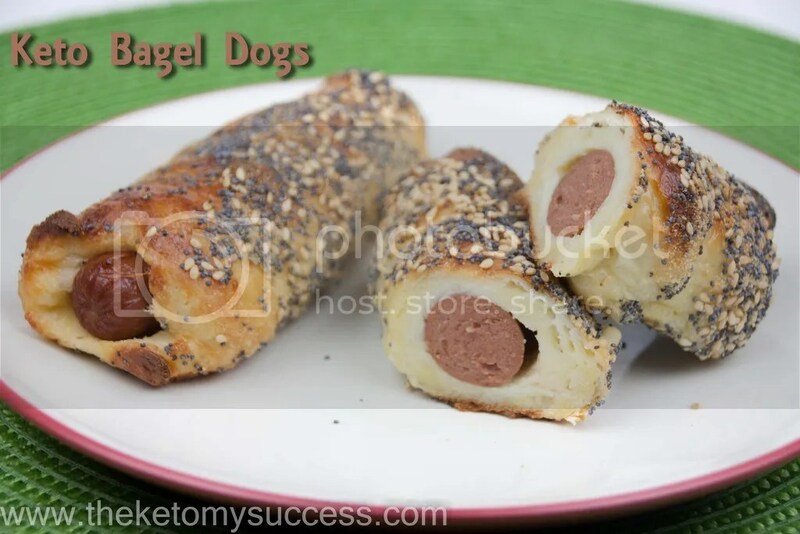 Your kids will fall all over themselves for these bagel dogs. Who am I kidding…you will fall all over yourself for this childhood favorite. I know that my kids love all things bagel or pretzel. One of their favorite treats is to go to Auntie Anne’s in the mall. We don’t do it often but sometimes you need to reward good behavior when shoe shopping with four little ones. Reward/bribe/hold hostage…you know where I’m going with this one. These bagel dogs are very much like the pretzel dogs at Auntie Anne’s so it was not a stretch that the kids would recognize them and love them! This recipe is really very simple. It is just another amazing take on the Fat Head dough; this time encasing a delicious all-beef hot dog. The recipe results in four hotdogs buy I typically make several batches when I make them. You can also change around the topping on each batch. Think about your favorite bagel store – the possibilities are endless – onion, everything, Asiago, cheddar, six cheese, poppy-seed, sesame, etc. They freeze and reheat really well so might as well make a lot. 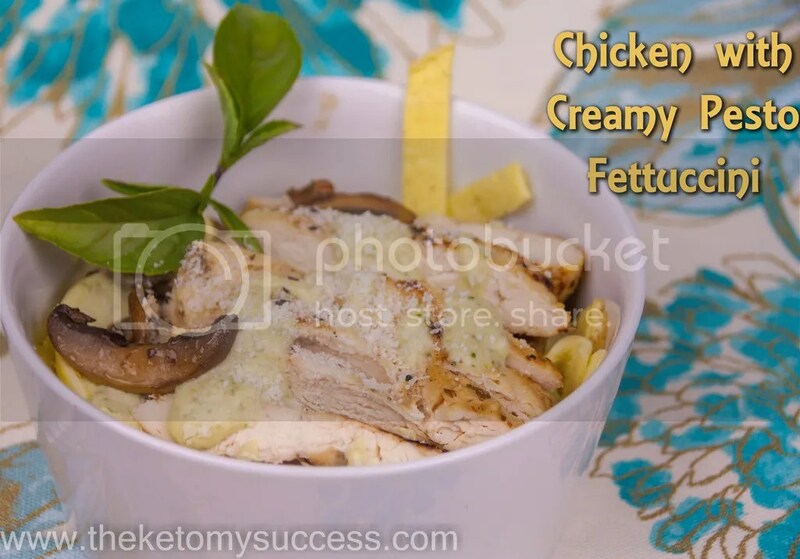 Place the mozzarella cheese and cream cheese in a mixing bowl and microwave for 90 seconds. Sir the mixture to combine. Ensure that the cheese is completely melted. In a separate bowl, combine the almond meal, 1 egg, and xanthan gum. Mix well. Add the hot cheese to the almond flour mixture and work them into a dough. Slightly dampen your hands and knead the dough in the bowl until completely combined. Separate the dough into 4 equal portions and roll into a ball. Place on parchment or a silpat. Gently roll each ball out to a 15" rope. Note: Having damp hands will help with the dough sticking. Wrap each piece of dough around each hot dog. Beat remaining egg in a small bowl to make the egg wash. Brush onto each hot dog. Mix all the Everything Spices in a bowl and roll the hot dogs in the mix to coat. Place the dogs on the lined baking sheet and bake for about 20 minutes, the dough should be slightly golden. NOTE: You can reduce the carb count by coating the dogs in cheese rather than the seeds. I’m not sure why but every once in a while I get a craving for something out of the norm. I was buying some cookies at Paradise Bakery…relax I was taking them to a customer….and got a craving for an oatmeal raisin cookie. Houston we have a problem! I knew that I couldn’t have high carb oatmeal or super high carb raisins. What is left? I started searching on Pinterest and Googling low carb oatmeal cookies. The results were far and few between and none really sounded like they would hit my high expectation or satisfy my craving. What was I to do? Well, I took the chocolate chip cookie cup recipe that I knew was terrific and tweaked it and reinvented it. Voila! The oatmeal cookie cup was born. I took out the chocolate chips and added cinnamon, a little nutmeg, chia seeds, hemp seeds, and pecans. There is no oatmeal. There are no raisins. These cookies give you the bite and comforting flavors of an oatmeal cookie without jeopardizing your carb count for the day! I told you in a previous post that I had some great friends and family that want to start a keto lifestyle. One of my friends loves all things BANANA. As we know, bananas are a no-no. They are full of deliciousness but also full of natural sugar. I had tried a couple of poke cakes recipes but wasn’t entirely happy with the results. The part that I did love was the banana custard that layered the top of those cakes. It hit me that these oatmeal cookies were the perfect accompaniment/vehicle for the banana custard! These two desserts are a match made in heaven. The takeaway is to use your imagination. You can find adaptations for most recipes online. If not, then take what you know, the help of others, and recipes already in your repertoire and reimage them. If that doesn’t work then message me! I love a challenge and I love that this has become my creative outlet. Together, I am confident that we can find something that will satisfy your craving and help you stay on the program. Preheat oven to 325F. Butter a mini muffin pan with 24 cavities. In a large bowl, whisk together the almond flour, Swerve, Sukrin, coconut flour, baking powder cinnamon, nutmeg, and salt. In a mixer, combine the melted butter, egg, molasses, and vanilla extract. Slowly add in 1/3 of the dry ingredients and let combine. Continue to add in the dry ingredients 1/3 at a time until it has all been incorporated. Finally, add the chia seeds, hemp seeds, and chopped pecans until just mixed. Use a small scoop to portion the dough. Roll each portion into balls a place into the cavities of mini muffin pan (approximately 24). Press into bottom and up sides of mini muffin cavities to create a cup. Bake 12-13 minutes, until they are golden brown. Remove from oven and press cups back into shape with the handle of a wooden spoon. Let cool 15 minutes, then gently loosen from pan with a sharp knife. Let cool completely. Heat the heavy cream and sweetener in a sauce pan over medium heat and bring to just a simmer. In a mixing bowl, whisk together the egg and egg yolk. Slowly stir in about ½ cup of the hot cream mixture, whisking constantly. Then slowly whisk egg mixture back into hot cream mixture. Cook another 4-5 minutes, whisking continuously, until mixture begins to thicken. Remove from heat and whisk in banana and vanilla extract. Sprinkle surface with xanthan gum and whisk briskly to combine. In a stand mixer, whip cream, sweetener, and vanilla until soft peaks form. Whip in the smoothed gelatin mixture, stopping to scrape the sides of the bowl twice. Whip until stiff peaks form but do not over beat. I wanted to start this blog post with the above quote. It really resonated with me because starting a ketogenic lifestyle requires a lot of changes and a sincere commitment. Lately, I have been getting a lot of positive feedback from friends, work colleagues, and my customers about the weight that I’ve lost. In all honesty, it feels good – if I allow myself to accept the positive energy. I think that a lot of us that have grown up overweight have a difficult time allowing ourselves to receive that positivity. I have a re-energized drive to progress to new levels in my career. This has been a truly life changing experience. These are the changes and successes that I need to continue to focus on when I hit plateaus and feel like I have stalled in my weight loss. I have gained so much more that just a better physique – I got my mojo back! Pacers game for work with my colleague and customers. I told you that I would give you the ups and the downs when I started this blog. I have hit a plateau…a big one. The plan is to get my ketones UP and my weight DOWN. At the core of the plan….the basics. What does that mean for me? Dinner – 4 oz protein & vegetable with oil and/or butter or a salad with protein and dressing. Snack: I may or may not have a snack. If I do, it is typically a cup of coffee with heavy cream or some macadamia nuts. **Side note: macadamia nuts are my personal drug of choice. They are salty, a little sweet and all around delectable. So far, so good. 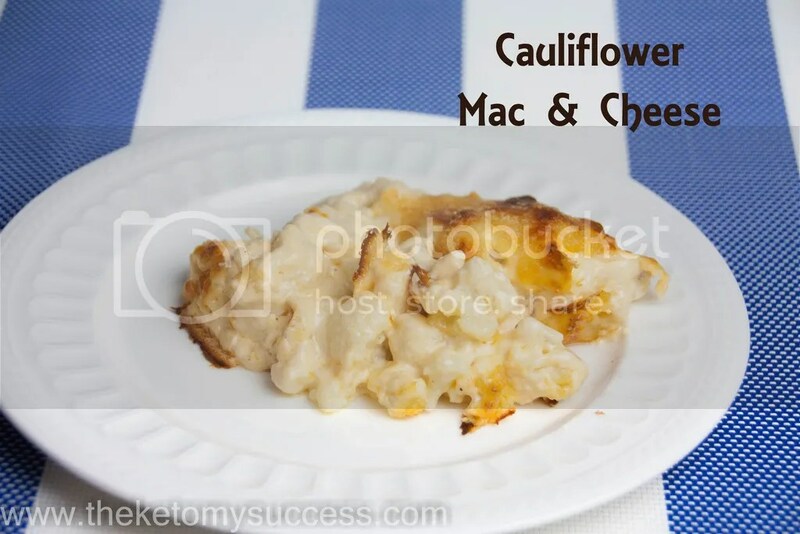 Last night we had roasted turkey breast, broccoli with butter, and some of this delish cauliflower mac & cheese. What I like most about this recipe is that you can switch it up. I like to add bacon to mine but have used different things that I’ve had on hand, like chorizo and green chilis or ham! This is definitely a staple side dish in our house and is great to take to pitch ins and family dinners. Enjoy! Bring a large pot of water to a boil. Season with salt. Carefully drop the cauliflower into the boiling water and cook for 5 minutes. Drain thoroughly, and place the florets on paper towels to soak up any remaining moisture. Put the cauliflower in a large bowl and set aside. To a large skillet over medium heat, add the heavy cream and bring to a simmer. Whisk in the cream cheese until incorporated. Add the cheddar cheese, mozzarela, crisp bacon at this point. Remove the cheese sauce from heat and pour over the cauliflower. Stir to coat the florets evenly. Sprinkle with the remaining 1/2 tsp of salt and the pepper. Spray an 9x13 baking dish with cooking spray. Transfer the cauliflower mixture to the pan. Top with the parmesan cheese. Place the pan in the preheated oven. Bake for 20 minutes or until the top is browned. 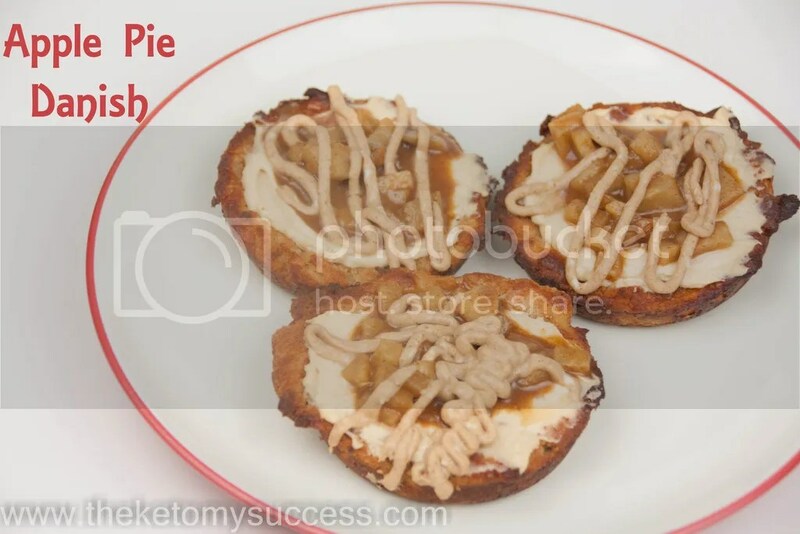 These “apple” pie Danish are a great start to your weekend! I think they would be great for a change of pace over the weekend or for when you have guests staying with you. The kids were cautious but 2 of the 4 tried them and approved so I will take that as a W! Once again, the mozzarella bread/crust mixture comes to the rescue. The apple pie spice and cinnamon transformed the dough into a sweet pastry. I just find it amazing how a little almond and coconut flour mixed with cheese can create a dough that can create so many treats – without cheating. I hope that you are still reading and I haven’t lost you by the title of my post. I know there are some people who would stop reading at the word apple since they are not allowed on the Ketogenic plan. Here’s the trick, it’s not really apple…it’s jicama! Stay with me. I was skeptical too. Jicama is crunchy and has a little natural sweetness. The texture is similar to that of a Granny Smith apple but without the sugar or tartness. Once it is mixed with the spices, butter, and sweetener you will be whisked back to the days of apple pie, baked apples, caramel apples…you get the point. An apple wonderland! I made a full batch of 12 Danish and put a few in the freezer for a later date. I will check it out and see how they bounce back once dethawed. 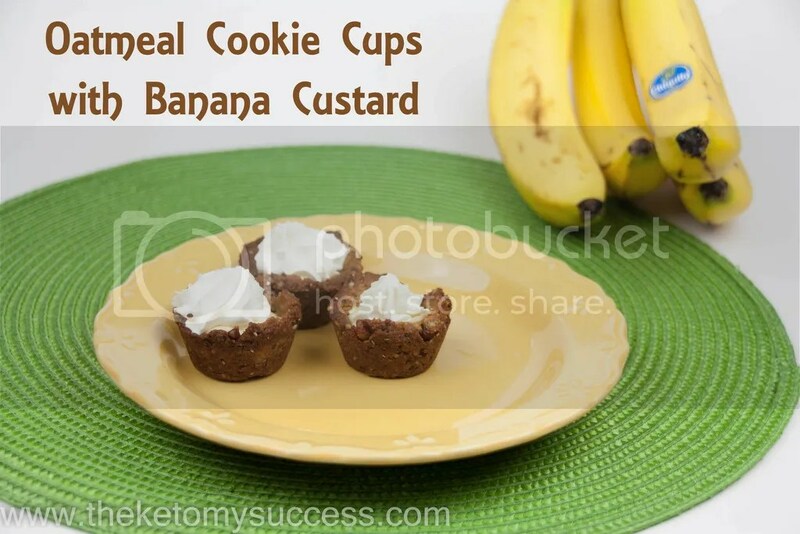 The next time I make these I would probably make a double batch. They aren’t hard to make but there are a couple of steps and it would be easier to double the recipe than make them twice from scratch. My hope is that we can have a stash of these in the freezer for a rainy day. These Danish are fantastic for a weekend morning or when company comes to visit! Mix all the ingredients together except for the mozzarella. In a separate bowl, melt the mozzarella cheese in the microwave (1-3 minutes). Once fully melted, mix well with the other ingredients. Once it makes a ball, you might want to knead it gently to ensure that all the ingredients are incorporated. *If you find that it needs to be more pliable, put it back in the microwave for 30 seconds - 1 minutes. Cut the dough into 12 even pieces and form in the whoopie pan. You will want to try to bring the dough up the sides so there is a well for the cream cheese layer. Bake in the preheated oven for 9-10 minutes. The pastry will puff slightly when baking. I took the handle of a wooden spoon and gently pressed down the centers of the Danish to more clearly define the well for the other ingredients. After you have done this, let them sit in the pan for a couple of minutes and then transfer to a cooling rack. Using a sharp knife or Mandolin, slice the jicama to about 1/4". Then thick dice the jicama slices. Add the jicama and remaining ingredients to a small saucepan and cook over medium-low heat until sauce thickens slightly. Set aside. This can be made ahead of time. Mix all ingredients in a medium mixing bowl. Refrigerate until needed. Mix all ingredients together in a medium mixing bowl. You can pipe this icing onto the finished Danish using a sandwich size Ziplock bag. Simply cut a small whole in the bottom corner and pipe onto the pastry. Once the crusts have fully cooled, top each pastry with about a tablespoon of the cream cheese layer, a few apples, and then pipe on the icing. Work has been crazy busy on top of some training out of town; so I haven’t been good with keeping up with my posts. I think you are really going to love this recipe. Pasta! Anymore, we generally don’t miss a lot of the starchy foods like bread, rolls, or pasta. This is a great alternative for those times when you just want some pasta. The pasta is very simple to make and tastes much like an egg noodle. The best part is that this is, again, one of those versatile foods that you can make to your tastes. For this round, we cut the pasta to a fettuccine size noodle and topped it with pesto-alfredo sauce, sautéed mushrooms, and grilled chicken. You can really mix it up with different sauces, veggies, and meats. I will also be posting my recipes for the Alfredo and Pesto Sauces. They are staples in our refrigerator! Fingers crossed that this cold weather is past us and we can start planting our outside herbs soon. We plant basil in the spring and make pesto throughout the summer so that we have a stockpile going into the winter months. The pesto at Sam’s Club is good but cannot compare to the fresh sauce you can make with your homegrown basil. Delicious! Next put all ingredients in blender and blend until smooth and bubbly. Pour onto foil and bake for exactly 8 minutes! Remove from oven, immediately remove foil from pan. I place the foil on table and let cool slightly. Cut tp desired thickness. In a past life, I used to think that a healthy/diet lunch would be to have soup and salad at Olive Garden. Now I know that that was not the best choice for me. Yes, my lunch would constitute almost 5 days worth of carbs! The good thing is that the salad is not a bad choice if you leave off the croutons and eat the full fat dressing. The Zuppa Toscana can be modified to fit a lchf lifestyle and you can have Garlic Knots in place of the breadsticks. You can have a very similar meal without carb loading and throwing your body out of whack. This Zuppa Toscana recipe is a winner. It has all the spicy flavor as the original but substitutes cauliflower for potatoes. I am not of the opinion that you can sub cauliflower for any carbohydrates in a recipe but it really does work in this soup. I really like the kale in my soup so I have also increased the amount from what is in the recipe. 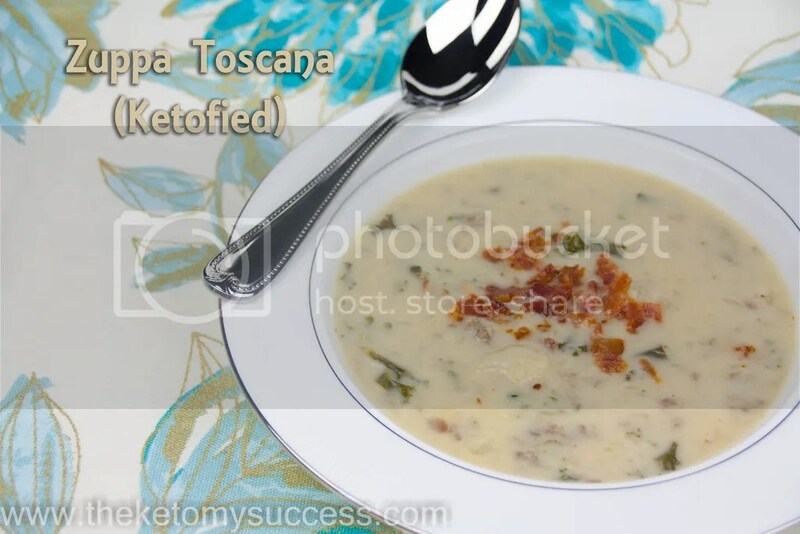 This is a keto-fied copycat recipe of the Zuppa Toscana soup at Olive Garden. Fry pancetta in a medium skillet until crisp; drain fat, put on plate and let cool. In the same skillet cook the sausage and set aside ( I put it on the back burner). In a large soup/stew pan put cook onions until tender and clear. Add in garlic and cook for a minute. Add chicken stock, tore pancetta, sausage, and cauliflower. Cook for 15-20 minutes (until cauliflower is soft).